This book summarizes five years of learning from data collected as part of the Global Accelerator Learning Initiative. The authors present data describing impact-oriented ventures and accelerators that operate in both high-income countries and in emerging markets. Blending survey data with insights from sector experts, their various analyses shed light on the basic structure of accelerators, showing where they are having their most promising results. Unlike previous studies, this book does not focus on a few high-profile accelerators (like TechStars and Y Combinator) and startups (like AirBnB and Uber). Instead, it compares a range of accelerator programs that target specific impact areas, challenging regions, and marginalized entrepreneurs. Therefore, it serves as a valuable tool for scholars, policymakers, and practitioners interested in the effectiveness of accelerator programs as tools that unleash the economic potential currently trapped in entrepreneurial dead spaces. This knowledge brief seeks to capture information about incubators and accelerators in Nigeria and how they support youth-led enterprises. The brief was developed using Global Accelerator Learning Initiative (GALI) data alongside interviews and stakeholder meetings held in Lagos and Abuja with support from Oxfam in Nigeria. In partnership with the ANDE India Chapter, GALI is working to increase understanding of acceleration and early stage ventures in India. This data summary includes information from 1,214 ventures operating in India, contributed by 26 accelerators. The third major report from GALI examines the ability of accelerators to drive funds into participating ventures and explores which programmatic choices correspond with superior outcomes. The report shows that in a sample of 52 accelerators, the average flow of incremental funds into participating ventures is significantly greater than the average that flows into rejected ventures. In the majority (but not all) of these programs, this difference exceeds the reported cost of running the program. These superior funding outcomes are accomplished in different ways; many programs are most effective at stimulating revenue growth, while others are best at increasing the supply of outside equity investment. Given these differences in program efficacy and different paths to funding success, we then examine how specific program choices correspond with the ability to drive funds into participating ventures. This data summary provides a snapshot of more than 2,500 early-stage ventures that applied to over 50 acceleration programs in Sub-Saharan Africa, and includes regional insights for East and West Africa and country-specific information for Kenya, Uganda, and Nigeria. More than 25% of the ventures in the sample are in the agriculture sector. Upon application to an accelerator, most ventures had earned revenue and hired employees, but fewer had raised funding. Ventures with IP were significantly more likely to report revenue, employees, and investment. Over half of the ventures include women on the founding team. Teams that include women were more likely to report revenue and employees but less likely to report equity. Fewer West African ventures had raised investment capital, compared to East African ventures. 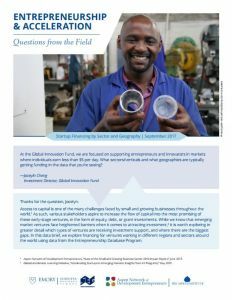 Compared to the global sample, African entrepreneurs are more interested in gaining direct funding and business skills. With the support of Citibanamex Compromiso Social, GALI is working to increase understanding of acceleration and early-stage ventures in Mexico. This report includes application and follow-up information from 318 ventures operating in Mexico, contributed by 15 accelerator programs. Ventures that participated in accelerator programs experienced greater growth in revenues, full-time employees, equity, and debt on average compared to rejected ventures. The majority of ventures reported no equity or debt growth at all, suggesting that a small number of strong performers are drawing up the average changes in equity and debt. The impact of participation is meaningful for ventures with no prior-year investment; participating ventures increased equity three times more than rejected ventures, and debt five times more. First-time accelerated ventures reported higher average revenue growth, while ventures that had been previously accelerated reported greater equity growth. Invention-based ventures reported greater average equity growth, while non-invention-based reported higher revenue growth. How do accelerators fund their programs, and how do different funding profiles relate to different accelerator offerings? 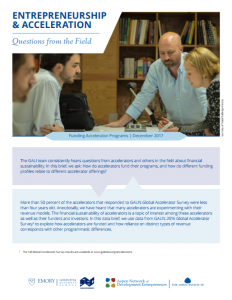 This study, produced in partnership with ANDE Brazil and ICE, uses the Global Accelerator Learning Initiative’s Global Accelerator Survey data in combination with interviews of accelerators and incubators in Brazil. 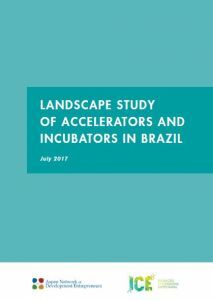 The report describes the profile of acceleration and incubation programs, highlights accelerators with an impact focus, and compares accelerators in Brazil with the rest of the world. This report is available in English and Portuguese on the GALI website.